General Motors CEO Mary Barra addresses the media ahead of the start of GM's annual shareholders meeting in Detroit on Tuesday. DETROIT -- Greenlight Capital Inc.'s proposal to split General Motors' stock was overwhelmingly rejected by the automaker's shareholders. Based on preliminary results, GM on Tuesday reported Greenlight's dual-class common stock proposal was defeated with more than 91 percent of the votes cast against the proposal, or 96 percent excluding Greenlight's shares. The hedge fund wanted GM to create a new class of dividend-paying stock for yield-oriented investors. The other class would have been aimed at investors seeking value and growth investment opportunities. Greenlight Capital's three nominees for the company's board also failed to garner enough votes. All of the GM board's director nominees were elected by wide margins, with each one winning by a range of 84 to 99 percent of the votes cast, the company said. GM shares barely moved on the news. The stock fell 3 cents, or 0.09 percent, to close at $34.43 on Tuesday. The vote ends months of campaigning by Greenlight founder David Einhorn, who did not attend the meeting, to split the stock. His firm -- GM's fifth largest shareholder with a 3.6 percent stake -- insisted that the split would lower the company's cost of capital and unlock between $13 billion and $38 billion of shareholder value. Greenlight Capital, according to GM, was represented at the meeting. However, no one commented or made a statement during the meeting. Einhorn, in a statement, said the firm was “disappointed” with the outcome of the meeting. He congratulated GM on “their win,” and urged the company to consider adding its board nominees in the future. Greenlight did not say whether it plans to re-propose the stock split at next year’s meeting. GM has adamantly opposed the proposal since it became public in March. It has encouraged shareolders to do the same. 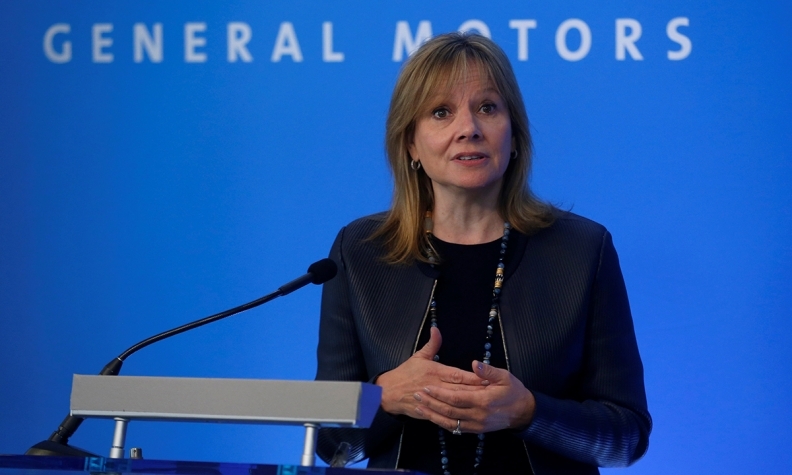 "After careful consideration, we determined that Greenlight's proposal is not in the best interest of our shareholders," GM CEO and Chairman Mary Barra told media prior to the annual meeting starting. The automaker has argued the split would create an unacceptable level of risk and would not serve the best interests of GM shareholders. "We believe that Greenlight's flawed, high-risk proposal will not create additional value," according to a statement on the company's proxy website. Several analysts as well as Moody's and S&P have publicly sided with GM on the matter. "While we believe that Greenlight's frustration with GM's sluggish stock is understandable given the company's impressive execution since emerging from bankruptcy, we believe that the proposed share division would not ultimately achieve outsized incremental returns," wrote Bank of America Merrill Lynch research analyst John Murphy in a March note to investors. The catalyst for Greenlight's proposal was frustration with the stock performance of GM, which has lagged the performance of the S&P 500 since the IPO in 2010. GM is one of several automakers to face mounting pressure from Wall Street, which has more recently favored high-tech disruptors such as Tesla Motors. Ford Motor Co. last month replaced CEO Mark Fields with Jim Hackett largely due to Fields not being able to move the company's stock. When asked whether GM needed to take drastic actions to convince Wall Street that its stock is undervalued, Barra said officials continue to right-size the business and invest in emerging technologies that it anticipates will lead to long-term growth and increased shareholder value. "We are going to continue to look to differentiate ourselves," she said. "Not only in our performance and the fact that we want to make sure we outperform throughout the cycle ... but also making sure people understand all the assets that we have and we bring to the future of personal mobility." Barra touted the the company's Bolt electric vehicle, acquisition of autonomous driving startup Cruise Automation as well as recent decisions to exit underperforming countries as moves that the company hopes will pay dividends on Wall Street. Greenlight's three candidates for the board of directors were Leo Hindery Jr., a veteran telecommunications industry executive; Greenlight executive Vinit Sethi; and William N. Thorndike Jr., managing director of Housatonic Partners, a private equity firm. GM had opposed the board appointments and urged shareholders to vote for the board's recommended nominees. Nine of 11 directors in the GM board are independent, plus Barra and former UAW Vice President Joseph Ashton, appointed by the UAW Trust. Other approved proposals at the annual meeting included officer compensation, 2017 short- and long-term incentive plans as well as the selection of Deloitte & Touche as GM’s independent registered public accounting firm. A shareholder proposal to request an independent board chairman was rejected.